More than 375,000 students arrived on the Chinese mainland from around the world for studies last year, a 5.77 percent increase over 2013, the Ministry of Education said on 19th March 2015. The 377,054 students came from 203 countries and regions, according to figures released by the ministry. The numbers coming from Oceania and Africa last year increased dramatically, but those coming from the Americas fell a little. A total of 6,272 students came from Oceania, a 32.24 percent increase year-on-year, while the number of those from Africa - 41,677 - rose by 24.93 percent from 2013. The numbers coming from the Americas dropped by 2.45 percent, but the ministry did not give a reason for this. Some students said they came to study in China because they were attracted by the country's political and economic development. James Mwita, 30, from Kenya, said: "China has a system that is working, and its political system is efficient. Its economic and social developments are impressive, and I hope my country can emulate them." Many international students also said they decided to study in China because of the significant amount of financial support from the Chinese authorities and universities. Asheida Charles, 29, from the Caribbean nation of Grenada is one example. Charles, who arrived in September, is studying international communication at Communication University of China. "I chose China because of the attractive scholarship package offered to international students," she said. "The quality of education is also impressive." But a survey by the Center for China and Globalization, a Beijing think tank, shows that international students make up less than 1 percent of the students at Chinese colleges and universities. Chen Zhiwen, chief editor of eol.cn, China's largest education portal, said African and Oceanian students' interest in China began late, leading to an apparent increase in students from the two regions coming to study in the country in recent years. Back home in Malaysia, students preferred to further education in China has been on the uptrend in line with global international students mobility. Statistics released by China Embassy in Malaysia revealed a total of 6,751 students were studying in China in 2014, an increase of 10.2 percent compared with a total students of 6,126 in 2013. In 2012, the number of students studying in China were 6,045 and 4,388 in 2011. Figure released also shown some 283 Malaysian students were on China government scholarship to study in China for the 2014/2015 academic year. Why Malaysian students choose to study in China? 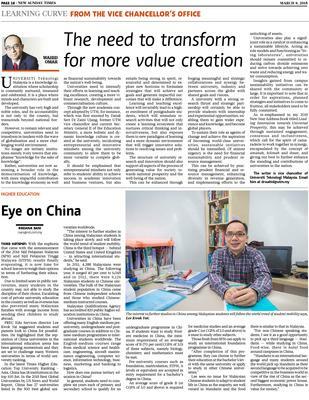 Read the education report "Eye on China" published by The News Sunday Times on 08 Manrch 2015 the reasons behind the increase of Malaysian students studied in China. THIRD HOTSPOT: With the euphoria that came with the announcement of the 2014 Sijil Pelajaran Malaysia (SPM) and Sijil Pelajaran Tinggi Malaysia (STPM) results finally evaporating, it is now time for school-leavers to weigh their options in terms of furthering their education. Due to limited seats in public universities, many students in the country not not able to study the discipline of their choice. Escalating cost of private university education in the country as well as overseas has also prevented many Malaysian families with average income from sending their children to study abroad. PREC Edu Services director Lee Kwok Yat suggested students and parents look to China for possibilities. He Highlighted that the reputation of China Universities in the international education arena has been gaining momentum and they are set to challenge many Western universities in terms of world university ranking. In the latest Times Higher Education Top University Ranking - Asia, China has 18 institutions in the top 100 list. In the 2015 Best Global Universities by US News and World Report, China has 27 universities listed in the 500 best global universities worldwide. "The interest to further studies in China among Malaysian students is taking place slowly and will follow the world trend of student mobility. China is the third hotspot - behind United States and United Kingdom - in attracting international students," he said. In 2011, 4,388 Malaysians were studying in China. The following year, it surged 40 per cent to 6,045 and in 2013, there were 6,126 Malaysian students in Chinese universities. The bulk of the Malaysian student population in China came from Chinese independent schools and those who studied Chinese-medium instructed courses. Malaysian Qualifications Agency has accredited 820 public higher education institutions in China. Universities in China have been offering many English-medium pre-university, undergraduate and post graduate courses in addition to Chinese-medium programmes to international students worldwide. The English-medium courses range from medical science and healthcare, engineering, computer science, information technology, business, marketing and banking to logistics. How does one pursue tertiary education in China? In general, students need to complete six years each of primary and secondary school to qualify for an undergraduate programme in China. If students want to study Western medicine, the minimum requirement of an average score of grade B (70 per cent / CGPA of 3.0) of three subjects, namely biology, chemistry and mathematics must be met. Pre-university courses such as foundation, matriculation, STPM, A-Levels or equivalent are accepted as entry requirement for a bachelor's degree in China. An average score of grade B (or CGPA of 3.0 and above) is required for medicine studies and an average grade C (or CPGA of 2.0 and above) is a must to study other subjects. Those fresh from SPM can apply to study an international foundation programme in China. "After completion of this programme, they can choose to further their education at the bachelor's level with the same university or apply to study in other Chinese universities." Lee sees no issue for Malaysian Chinese students to adapt to student life in China as the majority are well versed in Mandarin and the food there is similar to that in Malaysia. "For non-Chinese speaking students, I see it as a good opportunity to pick up a third language - Mandarin - while study in China. Food-wise, there is halal food around campuses in China. "Mandarin is an international language and many students around the world pick up Mandarin as their second language to be acquired to be competitive in the business world in view of the rise of China as the second biggest economic power house. Further more, studying in China is "value-for-money." 5. WHY NOT ENJOY THE BEST OF BOTH WORLDS? 6. Indian students in "China rush"